Thanks so much for your interest in St. James’ Episcopal Church. We hope you will visit us for one of our services, meals, or Christian education. Here’s a few things about us that hopefully can help. If you have any other questions, feel free to call us at (541) 396-2322 or email us at stjamescoquille@gmail.com. The Episcopal Church is a national fellowship of local churches. We’re bound together by our faith in Jesus Christ and our common practice in worshiping God as found in the Book of Common Prayer. The Episcopal Church is part of a larger, global fellowship called the Anglican Communion. We are, though, at our core, disciples of Jesus Christ and believers in his death, resurrection, and ascension. We are not perfect, but we strive ever to live a life dedicated to God in Christ. The form of our worship service is from the Book of Common Prayer (which you can find here if you’re interested). Most of the prayers in our service are straight from the Bible or from our Christian tradition. The center of our worship is meeting Christ in the Holy Eucharist, which we celebrate each week. We also sing hymns, hear a sermon (often, but not always from our priest), and pray for and with one another. If this sounds like a lot, or you’re brand new to liturgical worship, don’t worry. Members of the congregation will be more than happy to show you the ropes. For more information, see our page on Episcopal Worship. Are children welcome to come? Most definitely. In his ministry, Christ welcomed little children, and we follow his example. Children are welcome to attend all of our service from beginning to end. If parents are comfortable, it is best for children to sit up front, because most kids love watching the readers, organist, and priest (especially during the Eucharistic prayer). 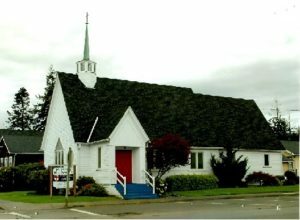 Children have the option of going to children’s church during the sermon, but they aren’t required to do so. Sunday Service, Holy Eucharist (Rite II), 9:30a.m. Prayer Breakfast and Bible Study, Wednesday, 8:00a.m. For more information on these services, check out our Weekly Services page. I want to join you for worship! How should I prepare? Come as you are. We have no requirements of membership or a dress code. God loves you and is with you. When we say “All are welcome” we mean it! All are welcome!